Show Me The Movies: Review: Mission Impossible: Fallout: Thrills aplenty in the series that just keeps giving! Review: Mission Impossible: Fallout: Thrills aplenty in the series that just keeps giving! The pulling power of Tom Cruise has been somewhat dented in recent times with box office outings such as The Mummy and American Made failing to live up to the heightened figures generated by his global brand so what better than a return to a successful franchise to steady the Cruise ship (sorry!) and showcase his considerable talents once more. The good news for fans of the Mission Impossible series and Tom Cruise is that this most definitely a return to form in an action series that just goes from strength to strength. Mission Impossible Fallout tells the tale of Ethan Hunt and the IMF team who join forces with CIA assassin August Walker(Henry Cavill) to prevent a disaster of epic proportions. Arms dealer John Lark and a group of terrorists known as the Apostles plan to use three plutonium cores for a simultaneous nuclear attack on the Vatican, Jerusalem and Mecca, Saudi Arabia. When the weapons go missing, Ethan and his crew find themselves in a desperate race against time to prevent them from falling into the wrong hands. With Cruise's long time collaborator and second time Mission Impossible director (a first for the series) Christopher McQuarrie on board, the action is energetic, frantic and simply jaw dropping and even though the plot can has more twists and turns than the Conor Pass, this feature all about the stunts and the incredible feats of an now in his 56th year as he demonstrates again all that is good about these movies and how well suited he is to the role of Ethan Hunt. Notable support from the usual MI motley crew of Simon Pegg, Ving Rhames and Rebecca Ferguson as well as a strong performance from Henry Cavill are evident here but this is unquestionably the Tom Cruise show as his amazing physical antics keep the audience hooked for what seems like a short two and half hours plus. Paris, London, Belfast and Kashmir all feature as backdrops to the stunning set pieces throughout and the astonishing cinematography is another welcome feature to what a summer blockbuster really should be. 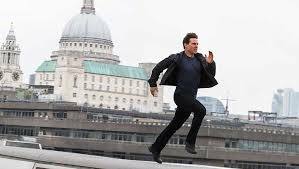 The Mission Impossible series illustrate clearly that a loud and energetic action blockbuster doesn't have to contain an over reliance on CGI and that there is nothing to compare with the energy of superbly choreographed stunt set pieces to thrill an audience. So do yourself and favour at Tralee Omniplex this month, buy yourself a ticket, load up on the popcorn and strap yourself in for a fun and furious roller coaster ride that will not disappoint!